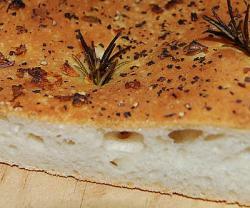 If you're looking for a garlicy Focaccia Bread Recipe with fresh herbs and olive oil You've come to the right place. 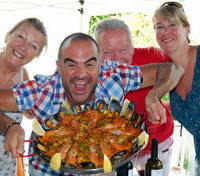 This authentic recipe makes a great accompanyment to any Italian, or in fact any Mediterranean Food. 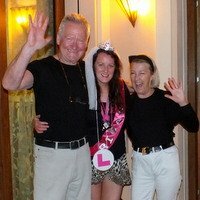 It's quick - easy - and cheap to produce, and so much better than the stuff you can buy in the Shops. Become a Real Baker with our simple, basic bread recipes. 2 cloves of garlic - chopped. 9 Sprigs of fresh rosemary. A grinding of black pepper. A good pinch of dried basil. 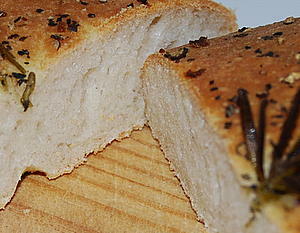 Place the bread ingredients in the Bread Maker in the following order: water - olive oil - flour - salt and yeast. Select DOUGH and start the cycle. Or by hand - In a warm bowl, mix all the dry ingredients together. Add the water and mix. Add the olive oil and mix to form a soft dough. Knead for about ten minutes on a floured surface. Return the dough into the lightly floured mixing bowl and cover with oiled cling film. Leave to prove in a warm place for 40 - 60 minutes or until doubled in size. When the dough is completed in the machine or by hand, remove it and knock back on a floured surface and roll out to an 8" x10" oblong. 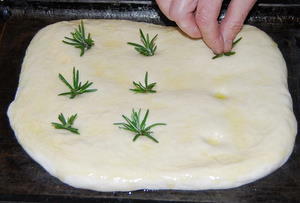 Make 9 holes in the dough with your finger (see photo) and place a sprig of rosemary in each hole. Now - sprinkle on the garlic and brush on the olive oil. Add the black pepper and basil. Then cover with oiled cling film and leave to rise in a warm place again for 30-45 minutes. OK - remove the film and bake in a pre-heated oven at 375f/190c Gas 5 for 15-20 minutes - until golden brown.